Usually I just cut them into 6 pieces (see image), but it's kind of messy to eat them this way. I usually cut all of the rind off. Then quarter the orange, cut out the seeds by cutting the inner corner out of the quarters. Then slice into as many pieces as desired. This leaves a little bit of the fiber on the orange, but nothing you have to remove before eating. It's slow the first time, but with practice, it can be done very quickly. For special guests you can 'segment' citrus, but I've always found it a thankless chore that wastes a lot of fruit, so I don't undertake the process lightly. This process is especially nice if you are using the citrus in something like a dessert or salad where the texture of the tough membrane can throw off the dish. However, as is the case with a citrus salad, the time adds up. To do it easily, it helps to have a really good paring knife, and a nice piece of fruit. Start by cutting the top and the bottom off, just enough to expose the familiar star pattern of the segments. Then, cut down the orange from top to bottom, removing the entire rind by section. Leave none of the white stuff, it only gets in the way. The smaller you make each strip, the more fruit you can conserve. You should be left with a bald, juicy looking thing. Now the membrane, which separates each segment, is exposed. To dislodge the first piece (always the hardest), slide the knife just membrane on either side. Once the first piece is freed, you have the room to peel back each membrane in turn. You be left with the essence of orange on one hand, and the deflated (and nutritious) husk of membrane on the other. It seems to me that you are complicating something which is inherently quite simple. Oranges come prepackaged in bite-sized chunks. Peel the orange by cutting the top off (about 1/8th of an inch, no more), scoring the sides with a knife (no deep cuts) and removing the peel and rind. 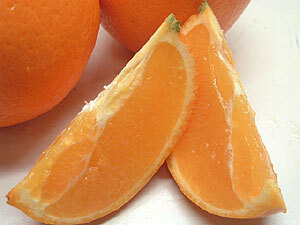 Once the orange is peeled, you can open it from the middle into two parts, using your fingers. There's a strip of pith in the middle that should be discarded. Then you separate each segment and serve as-is. The segment membrane of oranges is edible and pleasant, there's no need to remove it. This is not true of grapefruit/pomelos/sweeties though, where the membrane is much tougher and very bitter. I like serving them as half moons. I first wash them and then cut the 2 ends off. Make slices as thick or thin as you like, then stack the slices and make one slice down the middle making half circles. They are very easy to eat out of hand as you pull the slice open, all the litter segments pop up into little triangles that are very easy to eat with no mess. This only works well with Navel Oranges as they have no seeds. Not the answer you're looking for? Browse other questions tagged oranges presentation or ask your own question.